Among the residents of Kensington Gore was the philanthropist and parliamentarian William Wilberforce, whose name is associated with the campaign for the abolition of the slave trade. 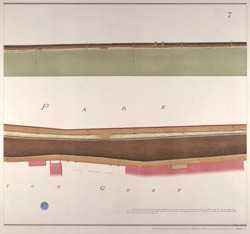 Gore House, where he lived between 1808 and 1821, is depicted in plan form on the south side of Kensington Gore. Built in the 1750s, the house was decorated by the architect Robert Adams. It was the most easterly of a row of mansions built in the 18th century between Palace Gate and Knightsbridge.